With so much freeware around, is there still a market for paid-for software? And which would be the top picks of the All About Symbian team? Free software for our smartphones has never been so abundant. From Nokia's stream of useful freebies to technology demos from big companies to small utilities from home developers, everything now seems to be free. Well, not quite. If everything was free then developers would go out of business and there wouldn't be any software for us to install in a couple of years time. There are still quite a few commercial applications which have proved their worth to the All About Symbian team over and over again and for which we most definitely do recommend opening your wallet and investing. I asked each member of the team to pick their three top commercial (i.e. not free) applications (and not games), and am proud to present their choices below. 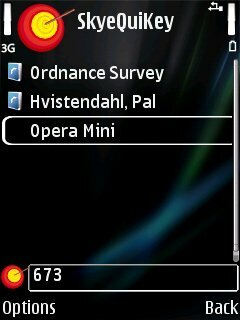 It's also worth noting that most of the download/buy links below are to the All About Symbian software shop. This is actually powered by Handango, as I'm sure you realise, but by buying through our shop, you're helping pay Rafe's server and wage bills and thus directly helping All About Symbian to keep going. You won't pay any extra going through our shop, so it's a win-win situation for all of us. And, before you ask, none of the app choices below were in any way sponsored or skewed in favour of advertiser money. The team members below were kept as much in the dark as possible about how this feature was going to be presented. So.... enjoy! Quickoffice will be familiar to most users. It allows the viewing and editing of Microsoft Office (Word, Excel and PowerPoint) documents and is available out of the box on most S60 and UIQ phones. However in most cases only the read-only version is provided and more importantly, because of the lead times required by phone manufacturers, the built-in version is usually a step or two behind the current release. Quickoffice Premier 5.0, the latest release, added support for Microsoft Office 2007 (which used a brand new, XML based, document format) and printing functions for Eseries devices. In use Quickoffice is impressive, from sensible user interface decisions to near perfect document round tripping, it shines in almost all areas. In his review Steve concluded that it 'is currently the 'best' office suite available for any smartphone' and I agree. Quickoffice might not be the most exciting piece of software in the world, but if you need to edit documents on the move then it is absolutely essential. I'm hard pressed to think of another piece of software that adds such a significant chunk of functionality to smartphones. 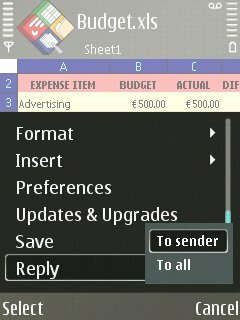 RoadSync, from DataViz, is an Exchange ActiveSync client for Symbian phones. It enables over the air sync of email, contacts and calendar with a Microsoft Exchange server. New email, contacts and calendar entries are pushed to your phone as they arrive or are added to the server. Microsoft Exchange is popular among Enterprise users, but can also be used by individuals through service providers such as 4Smartphone and Mail for Exchange. It is particularly useful if you access your email and PIM information across multiple devices. It also makes initial device set up easy; you simply fill in the relevant server information and after the first sync all your contact, calendar and email information is ready to go. S60 devices do have the option of the free Nokia solution (Mail for Exchange), but RoadSync offers more features and is more stable in use. Notably, RoadSync, unlike Mail for Exchange, has full folder support and the ability to search the full contents of your mail box online (rather than just what it is stored on the phone). On the flip side, RoadSync does tend to use more memory, but that's far less of a problem than it used to be thanks to the increased RAM in recent devices. Sony Ericsson users get a free copy of RoadSync with their phone and Motorola Z8 users can buy a copy of the UIQ version. Handy Taskman, from Epocware, is a replacement for the application switcher built into S60 (the one that pops up when you hold down the S60 key). Now that most S60 phones have a reasonable amount of RAM, it is possible to have multiple applications open at once and switch between them as needed - it is faster to switch to an already open application than it is to start an application. The default task switcher starts to become cumbersome when you have 4 or more applications in use and it is here that Handy Taskman comes to the rescue. It is able to display more applications and information because it occupies the full screen, making application switching faster and easier. There are a number of other useful features too, such as a 'recently opened' application list and a 'look up and start' function which lets you locate any application relatively quickly. It also displays information about memory usage and provides a way to close or kill misbehaving or recalcitrant applications. 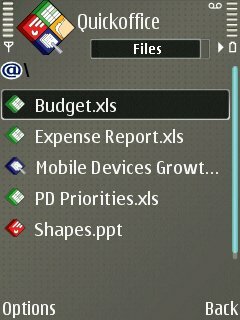 Epocware have been around the Symbian OS world for a long time, and their suite of applications, while not flashy, have been a mainstay on my handsets. Their 'Handy Tools Pro' bundle allows you to buy acollection of application at a much reduced price. The S60 version has eleven applications (Handy Calendar, Handy Safe, Handy Weather, Handy Clock, Handy Convertor, Handy Blacklist, Handy Taskman, Handy Profiles, Handy Keylock, Handy Calculator and Handy Expenses) and you save $129 on buying them individually. The UIQ version has 5 applications Handy Day, Handy Safe, Handy Weather, Handy Clock and Handy Expense and saves you $34.80. Good value and good applications go hand in hand. My personal favourite would be Handy Day (UIQ only). This provides a single screen that gathers information from all the PIM and Messaging applications on the handset, and uses the side scroll-wheel to flip between different views, depending on your needs at that exact time. Add in the ability to have shortcut icons to your favourite applications and you can effectively replace the standby and app launcher screens to something that is much more task and diary-focussed. You'll notice that single application from this bundle have been chosen by other members of the AAS team - a testament to all round popularity. While the built in email client on all the Symbian devices is serviceable, it does leave a lot to be desired, especially for those of us who have to handle a lot of mail, and don't have a huge amount of time while on our mobiles to do so. One of the main advantages of ProfiMail is that it can read full HTML mail, the built in mail readers struggle sometimes with anything more than plain text. The inclusion of timed downloads (either just the small headers or all the contents of your mailbox) provides something that closely resembles the speed and flexibility of a push email system. And the addition of rules is great when I'm on the move. 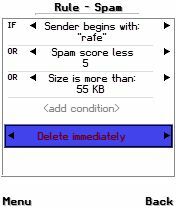 I can set up Profimail to ignore all emails, unless they're from Rafe, for example, in which case I've set up Profimail to download the whole content of the mail (Steve has the same rule, but I ignore all his attachments!) There's also the font size. Profimail doesn't follow the style guides of the platform, but uses a nice small font, and as much screen space as possible for the information. Given how sensible this is, and how much it opens up my email to fast reading, I'm more than happy with it. For the globe trotting reporter, Worldmate Professional is probably a must have. While the idea of multiple clocks for different time-zones was the starting point for Worldmate, this application has increased to become a powerful suite for the traveller. Alongside the clocks, the local weather proves useful once every 24 hours... and when I say local I mean where you are that day... and it is updated online, along with a forecast of the next few days. I particularly liked the ability to keep a checklist of my luggage - because I try to travel as light as possible, I tend to take the same items with me every time. Worldmate remembers the list for me. And the usefulness of the online Flight information, letting me note my schedule and see real time delays, departures and gate information is invaluable. Once you make one tight flight connection thanks to the advance notice Worldmate gives you, you'll never begrudge the annual subscription fee ever again. Also mentioned above by Ewan, as part of Handy Tools, Epocware's encrypted daabase app is the cornerstone of my smartphone world. Currently running at over 1000 passwords, PINs, reg codes and ID numbers, my life is many times too complex to be kept in my head. Now, password-protected database apps are ten a penny, but Handy Safe is unique in that it does a full two-way sync between the desktop client and the smartphone one. So I can enter details or edit entries on either and reconcile them later. I always have the latest information with me and yet, if I lose my phone or get it smashed by an angry polar bear, the info is also still safe at home and only one sync away from getting onto my replacement device. Nothing to do with the Epocware software suite, despite the name similarity(! ), HanDBase has been around for years on other platforms but has also become established on S60 as well. As with Handy Safe, there's a full PC client, which means that you can do all the tiresome importing, entry and editing of data on the desktop and then simply copy the database file onto your smartphone for use on the road. 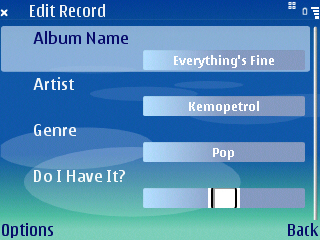 This being a generic database app, you can set things up in any way you like, with the usual text, numeric, currency, date and note fields, and it proves ideal for customer or parts databases, collections of books, CDs, etc, work records, company address books, and anything else for which there's a lot of data that you really don't want cluttering up your main contacts stores and other PIM files. As with Handy Safe, there's password functionality, so I guess there's some overlap here, although HanDBase's desktop connectivity isn't a true sync solution, it involves a manual file copy. Still a great workhorse for the power user though, and the compatibility between colleagues' Palms and Windows Mobile HanDBase installations is the icing on the cake - files are identical at the binary level and don't have to go through a PC. The tricky thing with Mobiola's software is choosing the right tool for the task - you see, they make quite a few products with similar, if not overlapping, functionality. However, each does what it says on the tin and I've grown to rely on it over the years for giving me a way to get my smartphone's screen on my PC, for giving demos and for capturing with video software as part of my Smartphones Show and for CD-based tutorials. Impressively, it works as well over Bluetooth as over a cable connection, although figuring out which of your virtual COM ports is the right one on a busy PC with multiple smartphones (as in my case) takes a little trial and error. The feed from your smartphone is made available as a video source to any generic video editing software, so you can import it directly in real time, which is just so cool. Like its name suggests, this application is truly a Swiss Army Knife for all UIQ 3 smartphones. 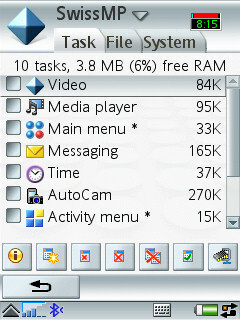 It has 3 main modules, Task manager, File manager and also System Monitor. On top of that, there's the status icon which can be configured to display time or remaining RAM Memory in the UIQ 3 status bar. And accessing many other useful functions, like launching applications, cleaning unwanted memory leaks, and so on. I can't imagine how a UIQ 3 smartphone could be used without it. feel lost without. It's very useful to manage all sorts of lists, from a simple grocery list, to GTD, to keep track of projects. It's only limited by your imagination. On my P1i, I use it to keep track of my office duties, as well as a long list of movies and also my todos. You have to experience Projekt to love it! A product that should be included as part of the operating system, SykeQuikey allows you to access contacts, applications and web bookmarks by typing the first few characters of the name using T9 input from the Active Standby screen. This means I can access almost anything on / via my device with no more than a few keypresses. I always like to add software and customise my devices, and this application means it's all quickly available ... and without spending ages customising Task Manager applications for fast access to particular functions. Ever since I got my first PDA (a Psion 5), and on any other PDA I've ever had, including the horrors - for me - of keyboard-less Windows Mobile devices, I've always used some sort of list manager(s). Some were specific (e.g. native Data, RMRShop and RMRTask on the Psion), and others were more generic (e.g. ListPro on Windows Mobile). 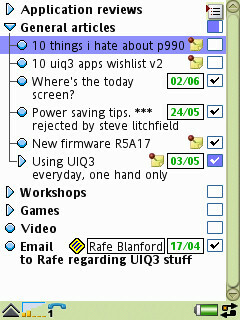 On S60, I tried various database applications with various levels of frustration (despite a degree in Computing and no worries about databases in general), but none could filter a list for my choice of items and then allow me to check them off - as required by a ToDo list or Shopping list. Then, along came Kylom's Projekt. This is a hierarchical list manager that allows you to create reusable and one-off lists, with categories, links to alarms, contacts, Documents, Calendar entries, etc., and rich text notes. My most-used lists are reusable ones, such as my weekly supermarket shopping list, a general purpose "next time I'm in town"-type shopping list, a categorised checklist for things to pack when going away, and a Notes list - somewhere to jot down interesting things for later. Projekt has special shopping list features that allow you to quickly note the items you need to buy, and then switch to Shopping mode where (if you so choose) the Select button can be used to tick off the items you've already picked up. 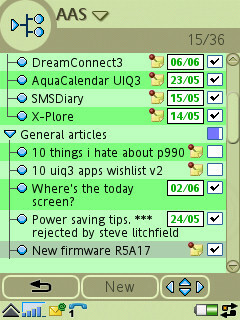 The default green and white striped computer listing style layout is not to my taste, but that's easy to change (see example in the screenshot). I'm eagerly looking forward to a future version with more GTD functionality, such as categories of more than one character. Projekt takes pride of place as the first app on my Active Standby Shortcuts. Another application that really should be built in to the operating system, if only in a cut-down version, Best Profiles allows you to switch profiles and a whole load of other associated things according to various rules. Each profile can be configured with its own Wallpaper, Sound on activation, Sound Volume, Bluetooth setting, Backlight setting (Normal/On if charging/Always on), Theme ... and the killer feature: Application(s) to run when the theme is active. Prioritised rules for which profile to use can be set using a combination of Schedule, Keywords in the calendar, GSM locations, and charger setting. I have Scheduled rules for Silent profile with a dark theme at night, General with a white theme during the day, with a transitional "meeting" style profile late at night and early mornings (so if I'm awake I'll hear the subtle text alert/ring tone, but they won't wake me up if I'm asleep). I also have certain keywords in the calendar which trigger the Silent profile for things like Doctor's appointments, meetings, etc. Finally, the one that makes the most noticeable daily difference to the ease of use on my device: I have a Car profile, which is set up with a dark theme (so as not to be distracting when driving). This profile is automatically activated if the phone is on charge during the day (overriding the lower priority General profile) ... which means it's probably sitting in my Brodit powered cradle in the car. The clever bit is that it automatically starts up the Podcasting app, so I can listen to my choice of podcast via the headset socket connection to my car radio on my daily commute or longer journeys, and with the Backlight set to On if Charging, the keyboard lock doesn't activate (a useful side-effect), so it's easy to select a new podcast when I need to. So there you go. Thanks all, for your selections!